These are absolutely beautiful, Miriam! Great job completing them. 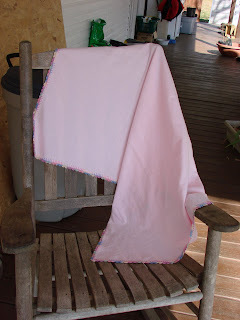 I know Bekah will really enjoy the pink blanket, as will whoever uses the other one! Your blankets are beautiful! Would you be able to share how you did the pink one? I have seen sort of similar ones but this one seems simpler and more pretty! 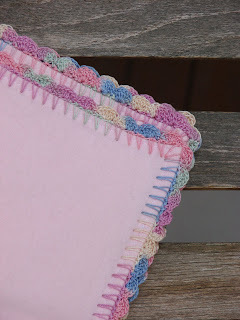 =:) I would love to make these to give as gifts, too (or put on my hopechest)! Thank you! Is the pink blanket fleece? How did you get holes in it for the yarn? I used pink flannel and as is was 45" wide, I got made sure to get it the same length. I hemmed it and using a size 7 to 9 crochet hook (extremely small) and crochet thread, I started crocheting around the hem of the blanket. First, I did the base chain and after having gone all the way around, I went over it with the shell chain. The small crochet hook that I mentioned above easily penetrates the flannel. The main thing is to keep the chains even and not too tight. That looks positively lovely! You did a fabulous job. Not that I am a chrocheter....but what size hook did you use? It was great to see a post from you! Miriam, those are beautiful! You did a great job!! I am going to show my Mama the pictures. She's working on a baby afghan now! Oh how cute! I'm a new blog reader, wandering over from I Have Loved The Rain...such a nice place to visit! I love the edging on the second one!! What size hook did you use for the edging? You said a seven or nine but....I look at the letter on the hooks and I go by that. 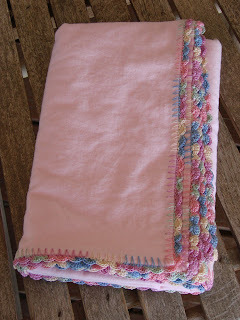 :) My great-grandmother did so much beautiful crocheted edges on hankies, blankets, table cloths, etc. It was so neat to see this! 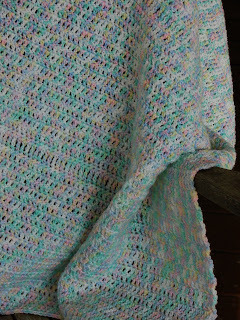 And I LOVE the crocheted blanket!! What yarn did you use? These crochet hooks aren't lettered, they are numbered. They are very small, steel not aluminum hooks. Oh, I mentioned a 7 and a 9 size hook because I started with the 9 and then it was lost, so I had to finish with a 7. Thankfully, it wasn't a big difference. Great job on the blankets! I like the edging on the pink one. I love the blankets! 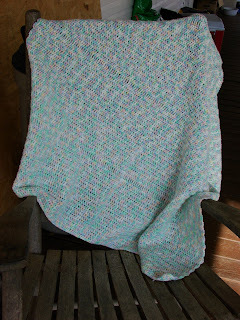 The baby blanket is beautiful! I love your blog too! Keep up the good work.